The National Association of Tower Erectors (NATE) today unveiled an Anchor Corrosion video as part of the Association’s acclaimed Climber Connection campaign. The video provides detailed information on the conditions and factors that contribute to anchor corrosion on guyed-towers. The video also includes practical testimonial footage from a tower climber highlighting the options available to the industry to mitigate and eliminate anchor corrosion. 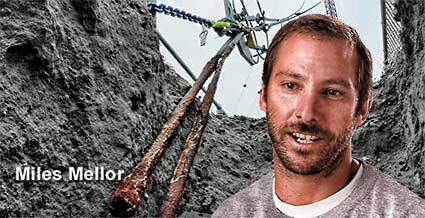 “Anchor corrosion is an issue that all tower climbers need to be cognizant of and this video is a great resource for the industry’s elevated workforce to utilize to help combat corrosion at guyed-tower sites” said Ryan Schock from Design Telecommunications Inc. in Charlottesville, Virginia. “It is paramount that workers at the tower site be familiar with the factors that lead to anchor corrosion and also the tools available to eliminate the corrosive effects of the anchor,” added Schock. NATE encourages tower climbers and all wireless industry stakeholders to actively participate in this campaign by posting the Anchor Corrosion video on their respective social networking platforms using the hash tag #ClimberConnection. NATE also encourages tower climbers to share their personal night climbing safety tips through social interaction on the Association’s Facebook and Twitter pages. The Climber Connection campaign was developed by the NATE Member Services Committee in conjunction with the NATE Safety & Education Committee and is designed to provide specific resources and communicate the Association’s message directly to the industry’s elevated workforce. A central element of the campaign is the official release of monthly Climber Connection safety videos; each focused on a unique safety topic or issue involving working at heights. Visit HERE to access the PPE Inspection, 100% Tie-Off, Capstan Hoist & Rigging, Workforce Professionalism, Tower Inspection, Gravity, Weather Conditions, RF & Antenna Identification and Night Climbing videos that have been previously released as part of the Climber Connection campaign. For more information on NATE, visit www.natehome.com today.